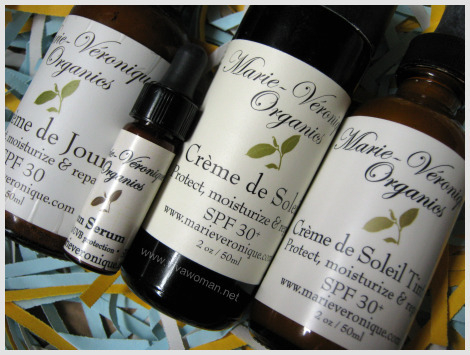 I’ve been using a DIY sun protection oil for quite awhile now under my daily sunscreen moisturizer. It’s quite easy to make and essentially, you only need two ingredients. One is a carrier oil with some UV protection properties and another is Astaxanthin, which is a powerful antioxidant that also protects our skin against the sun when applied topically. It’s been working well for me although I have to say it does give my face an orangey hue if I don’t put on some sort of powder. I got the 5ml Astaxanthin from SkinActives and it’s like going to last me forever because I only need a tiny bit for a full bottle of carrier oil. If I were to add too much, the oil would turn very dark and it’ll be almost impossible to use on the skin. 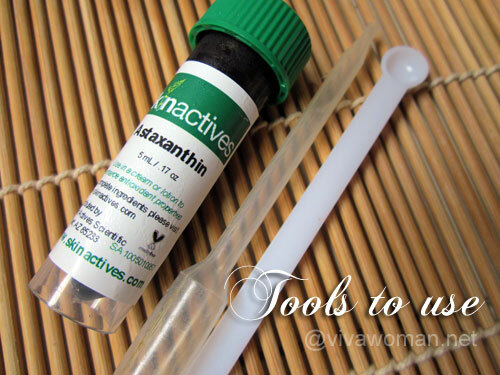 So a small scoop or a pipette is best for this purpose as I can control the amount of Astaxanthin dropped into my base oil. For the base oil, I used a mix of Argan and Sweet Almond Oil, both of which are said to contain some amount of UV protective properties. You can use other of oils with sun protection capabilities like Red Raspberry Seed Oil, Sunflower Seed Oil, Hemp Seed Oil, Safflower Oil, Macadamia Oil, Olive Oil, Jojoba Oil, or even Coconut Oil. You can use just one base oil or a mix but the more important point is to choose the oil or oils that work well for your skin. As you can see, the color is pretty orange but it’s not noticeable once I’ve got my sunscreen and face powder on. If you don’t want it that orange, then cut down the amount of Astaxanthin. The best is to add drop by drop and then test the color of the oil. I think I added a bit more than I should because I was desperate for the sun protection potency. 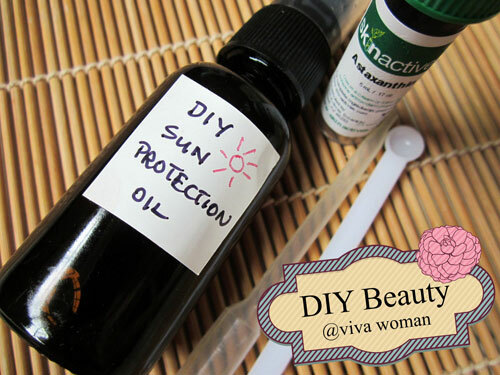 Now, please don’t ask me how much SPF this DIY sun protection oil is. I don’t know. All I know is that it gives me peace of mind when I use it under my daily sunscreen. I wouldn’t recommend using this alone unless you use a lot more Astaxanthin in the oil mix but in that case, be prepared to see a really brownish face in the mirror. once, I tried adding a drop of astaxanthin on my night facial oil and it really made me look like an old carrot, lol. But I guess as a non-regular treatment, it should be good for the skin. I’m currently using a DIY sun protection oil, too, but mine is for the body. For my face, I just use my normal oil and the Antioxidant Booster (when I can afford the orangey tint). I don’t wear makeup/powder so I only do it on some days when I know I won’t be meeting clients or going on a date. Old carrot…LOL! But yeah, not nice. In fact I realized that even with this oil and makeup, the tone on my skin is a shade darker. And without powder, my face looks like what the Chinese calls “huang lian po”! 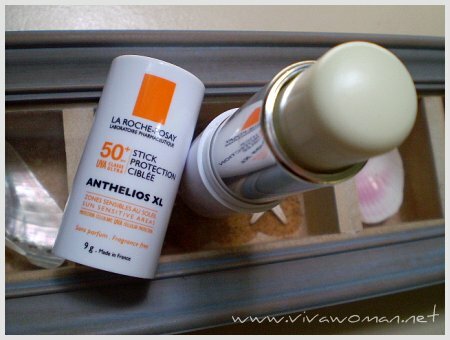 Oh I use the Antioxidant Booster too…usually together with this sun protection oil. Very KS! WOW! 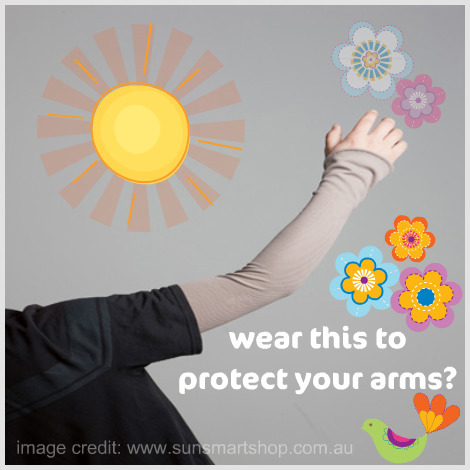 I would never thought of a DIY treatment for sun protection, thanks for sharing!! Swati last post is: My Mini-giveaway!! It’s great but it can be difficult to use. I quite like the supplements too…completed 3 bottles and going to order a new one soon. pretty cool! 🙂 I’m going to try making my own too..haha..thanks for sharing. I wouldn’t recommend sesame oil on your face if you are acne prone (like myself). Ever heard about it on a variety show, saying that a grandma applied a thick layer of sesame oil on her pimply grandson’s face to cure his acne, which did nothing but worsen the situation. I see…it does sound rich. Might have it used in my oil mix but certainly never tried it alone. This is fascinating. What’s the finish like on your face? Does it absorb well? Not oily but certainly leaves a slightly orange/brown tint. Great! This is very helpful, sunscreen is a must have for me! I must try on this one. Easy and affordable way to have a healthy and UV free skin. Yeah, affordable! Just be careful with the amount of Astaxanthin you use. I have taken 8 mg of astaxanthin a day for three years, and my skin never turns pink even in the California or Hawaiian sun. I don’t use sunscreen anymore, personally. The benefit of the supplement form of astaxanthin (as opposed to topical) is the benefit goes throughout the body. Its also helped my sight improve, joints improve, and sleep got better. I need my supply of astaxanthin! I was using the oil and astaxanthin oral supplements. I am definitely going to try this. Just wondering before i place my order at skin actives i fthere are any other great products that i may order at the same time.?? Anything you recommend or have written about ? Thanks! The Antioxidant Booster and the Every Lipid Serum is worth a try. I use the former daily. Others are the masks and stuff if you’re into it. Thanks Sesame! Great site you have! NO!!! If you use all, you’ll look like you’ve been burnt! Okay, enough of the exaggeration but no, you really don’t want to use too much even though it won’t ruin your oil in the sense that you can still use it. Just add a small drop first and see the change in the color of your base oil to determine how many more drops you can add. One or two drops can make a lot of difference. Whoopeekiddies.com used to carry it but I’m not sure now. It’s a seed oil, not essential oil. O, that’s the same as Dragon D’Or, correct? I’ll give them a buzz. Thanks! No, not the same…they do have business relationship but I was told they’re different entities. Inspired by your post, i made my own , It made me look so orangey. It does…you can only add a little. Hi! 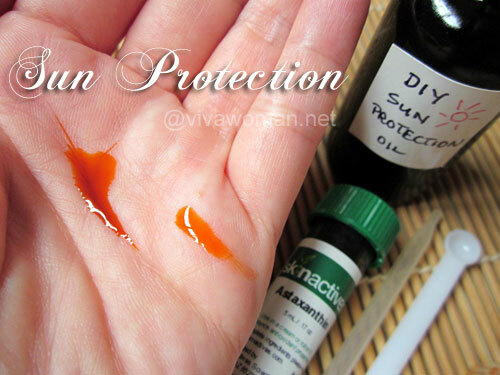 I’m currently using astaxanthin+sunflower oil as my sun protection oil but I recently got my hands on avocado oil, sea buckthorn oil and carrot seed oil. Is it okay to mix them with my sun protection oil? Yes you can but I can’t guarantee they’ll work well for your skin. Suggest you try a small batch first. I have been learning a lot from reading from your blogs. However I am very new regarding skincare. I have been ignoring myself for too long haha. So I was looking to skinactive products and I was wondering what base creams should be good for the active oils for hyper pigmentation . Right now I am researching about variety of different products and planning on to flow the multi steps skin regimen but I am clueless about what products to use and everything. Anyway sorry for this long message. Thanks for all your tips.